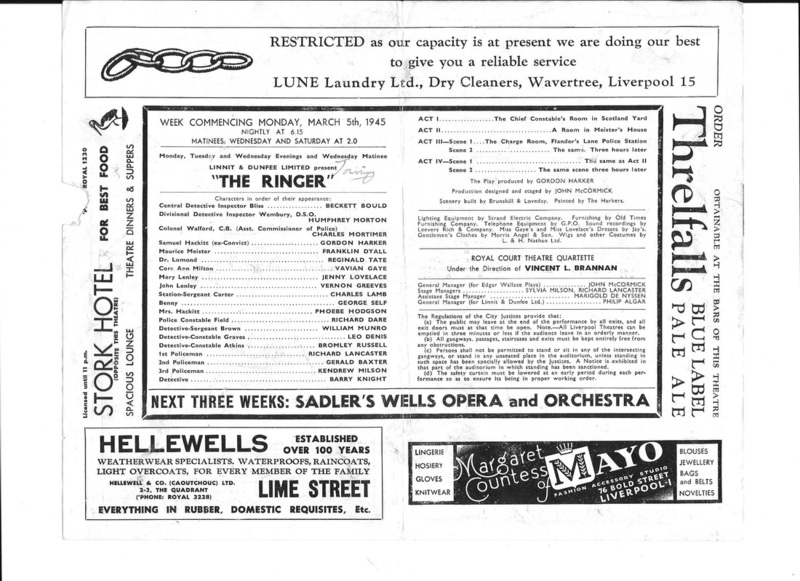 Charles Mortimer appeared as Colonel Walford in "The Ringer", at the Royal Court Theatre, Liverpool, in 1945. The following week, beginning 12 March, 1945, the play was produced at the Grand Theatre, Leeds. 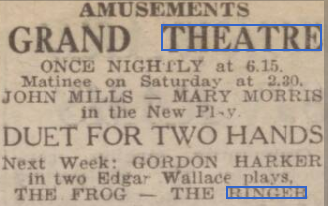 The play was performed on the Monday, Tuesday and Wednesday of the week, followed for the rest of the week by a production of "The Frog". It is, at present, not known if Charles Mortimer was in this production. Also in the cast were Gordon Harker, Reginald Tate, and Franklyn Dyall. 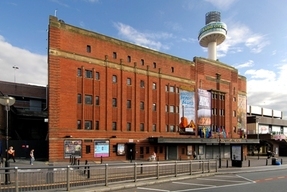 The play was seen at the Opera House, Manchester, and the Hippodrome, Bristol, in March, and the Grand, Derby and the Hippodrome, Coventry in April, 1945. From The Liverpool Daily Post of 9 March, 1945. The revolving stage at the Royal Court was sent whizzing round last night to reveal a dozen different scenes, and to effect half as many more scenic changes, in lan Hay’s lively stage version of a famous Edgar Wallace thriller "The Frog". Gordon Harker, whose comic Cockney crook proved enjoyable in ”The Ringer”, leans his weight humorously in "The Frog" on the side of the law. He plays the imperturbable Detective-Sergeant Elk. The characters include plenty of crooks (or frogs), a heroine, a vamp, a very gentlemanly detective (not Elk), and, of course, the usual posse of uniformed policemen. The evening is rich in violence, and everyone thoroughly enjoys the poison gas, the bombs, the shots, and the shrieks (of the abducted heroine). 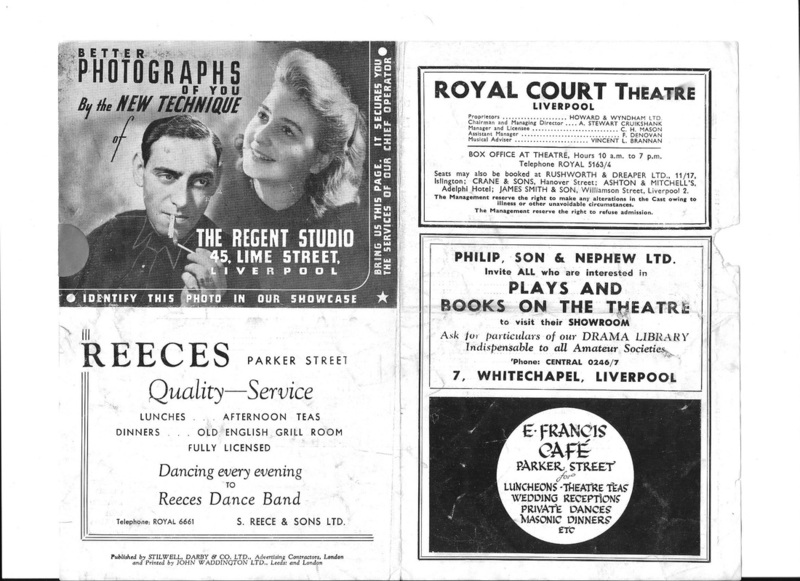 From the Liverpool Evening Express of 6 March, 1945. Edgar Wallace gave us many thrillers which most people at sometime or other have read. This week at the Royal Court Theatre, Liverpool, they have the chance seeing two them, "The Ringer," and "The Frog,” the last-named Thursday, Friday and Saturday. But those who intend seeing one or the other—and I strongly advise their doing so —should not look up the book version in advance. If they do they will miss, or shall I say spoil, a lot of the fun and enjoyment they will otherwise get. Last night. 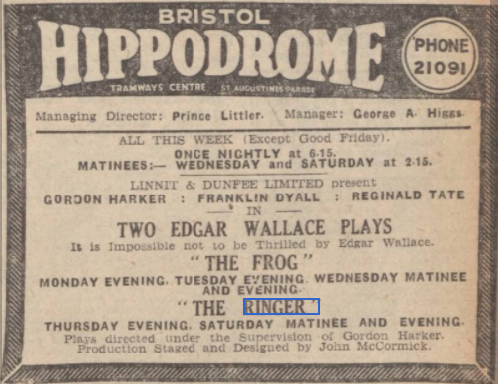 “The Ringer" held sway, and the manner which Gordon Harker (as an ex convict; Franklyn Dyall shady' lawyerl; Beckett Bould and Humphrey Morton (detective inspectors); Reginald Tate (doctor); and Vivian Gave (wife of the Ringer) put it over was so breathlessly exciting as to leave the audience in doubt up to the closing minutes to who was really “ The Ringer." In a play of this sort there is much need of trimmings. 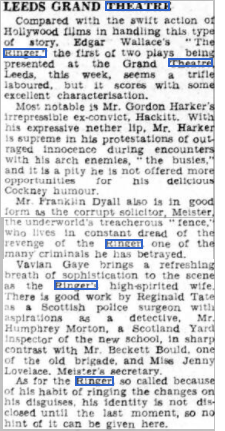 What could have been more vivid of an habitue of the police than the station outburst Phoebe Hodgson, the ex-convict’s wife, or Vernon Greeves, who, after finishing a stretch finds himself back in the hands the police through the ‘twisting’ barrister? Charles Lamb, the station sergeant, also added to the fun, and Charles Mortimer as Assistant Commissioner Police, certainly gave the production a good send-off. From The Coventry Evening Telegraph - Thursday 26 April 1945. From The Western Daily Press - Tuesday 27 March 1945. From The Derby Daily Telegraph - Friday 13 April 1945. From The Yorkshire Post and Leeds Intelligencer - Tuesday 13 March 1945.